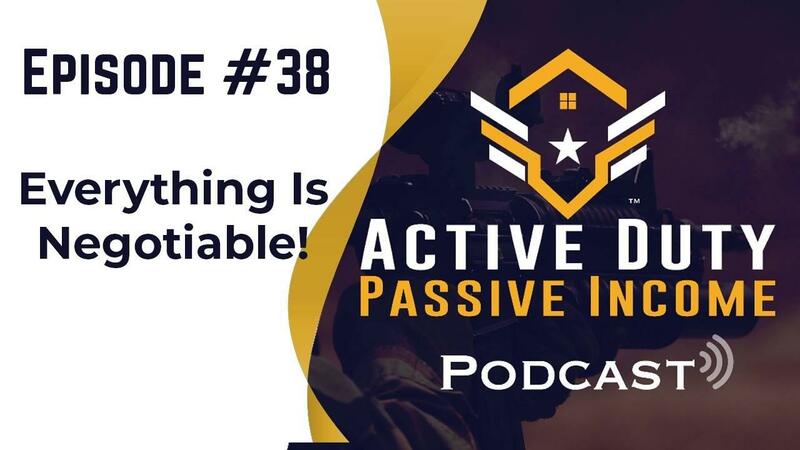 Hey what's going on guys welcome to the active duty passive income podcast? Super excited for today's lesson. Everything is negotiable guys that I need you to understand. That this is going to be a little takeaway from one of our rapid deploy students. Super excited for him going out there and taking action. Not only was he able to double his profits right, his cash flow from his rental property. But he was also able to learn something new right. He had assumed that the property management company that he was working with right only you know gave it only took ten percent of the rent right. That was the hard you know point for the property management fee and they could not come down any lower. Well guess what? We convinced him to talk to his property management company right. Go out there and take a look at other ones and kind of compare and see. So he went he talked to his property management company. he was able to reduce his property management fee to eight percent and then not only that, but we also had him you know go out and talk to a few people, a few experienced investors in the area and see if he had any wiggle room to raise his rents at all and guess what? He certainly did. So he was able to decrease his management fee by two percent and he was able to raise his rent up by about five percent and then he just about doubled his cash flow from his rental property. Can you believe that? That’s awesome alright and that is the kind of stuff that we want to see you guys do out there. Because you know everything is negotiable, everything is. So don't just assume that the current rate that's you are in right now is locked in. because it's definitely not. Right I mean business is business right. If someone is giving you a certain price, someone is almost willing to do it for a little cheaper. You just have to find that right person right or they'll just be willing to help you out right. It may be cheaper in some way but more expensive in another you know I don't know and they might be flexible and you got to flex it. Now yes, you may run into sometimes right the at the old adage right you get what you pay for. But I think you'll more run into that when it comes to stuff like upgrades and construction versus stuff like you know property management. As long as you find someone who is willing right and is reputable right, willing and is reputable you know that is completely fine. You’ll get good service out there and you don't have to pay top dollar for it all right. Just understand that you have to shop around. Don’t just go to like one or two different people, go to multiple people. Do five, do six if you want right. Try and find those folks out there who mesh with your mindset or who you know who seem you know more than willing to help you out. There are people out there guys. There are great people in this world you just got to find them all right cool. So everything is negotiable. Then let's talk about some few specifics all right. In terms of property management okay we already spoke about the management fee. Right the management fee is definitely negotiable. I think the national average is about ten percent. However I've definitely seen people do more. Which you should never pay more than ten percent okay. Let me repeat that. Never pay more than 10% on your management fee, got it? All right cool. But you can find some that are eight percent or sometimes even less. I actually heard of one of my friends it was doing 7% and I was like how the hell did you find that? And he literally told me he shopped around and he was able to find someone come down on that so for him. So I mean hey it's out there you got to find it. So yeah definitely make sure that you negotiate those. Also something you might want to negotiate are some of the fees that property managers may charge you. Some of the extra fees like you know a leasing fee or a renewal fee or a termination fee right. Well there are all these fees out there that certain property managers will charge you. A good rule of thumb, if you find a property manager that is charging you all these ridiculous fees there's probably a good indicator that they may not be that good. All right now here's my point on that and if you're a property manager and you're listening to this and you charge a bunch of fees, no offense but here's my thing on that. Because there are a lot of property managers out there that don't charge these fees and that get good business all the time right. So if a property management company has to charge you all these extra fees to make money, they might not be that great. Because they might not have that many rentals okay. So another question that you want to ask your property manager is how many rentals you manage right. if you're getting something really low like in the 50 and below scale and they're not starting out right like have been in business for quite a few years, you might want to find another property manager okay. Just saying. All right so anyway some of those fees right those are negotiable. Something else that's very negotiable the contract closing date right or the notice that I think that's the better way I say it right. The notice that you have to give for terminating a contract with them. Now this is a personal story okay. do not, I repeat do not sign up for more than then 30 days of notice for termination all right. A lot of folks out there will like a 60-day requirement you know to give notice for cancellation. Some have a 90-day requirement right. Do not do more than 30. Let me tell you 60 days is way too long if you need to get out of your rental contract okay. 30 days is ample enough time to terminate your lease and they may have charged a terminating fee that might not be something you can get around honestly. So just kind of keep that in mind. But you may still be able to negotiate it right. It doesn't necessarily have to be that high. So for my personal story I had a property management company for one of my properties in Mississippi that was absolutely terrible. I'm fully convinced that they never really went to my property even though they said they did. They were very very neglectful in their responsibilities for managing my property during its repair phase. They let one contractor take like two months damn-near and it was he was just repairing a deck like a little 400 square foot. Month and let it run right like who does that anyway. you know I'm just I'm just saying I had a very very bad experience with this property manager and I had to give them 60 days’ notice to get out of it. so that was an extra you know like two months that I had to deal with them just trying to find someone else to take over right. It didn't take me that long, it took me maybe like you know a week just to shop through a bunch of different folks that I was looking at. But yeah I mean and then I had to wait. You know I mean and then that was the worst part. I found someone I wanted to use and then I had to wait that extra time. so definitely make sure that you do your due diligence and you do not lock yourself in for anything that you can't get out of in 30 days okay, good rule of thumb. All right something else that's negotiable for property management. Oh it will also be that little deposit fee right that you put down. now if you don’t know what I am talking about; property managers usually ask you for a deposit that you want to put down for handling any kind of you know things that come up. A lot of times they will usually stick around 300 to 400. I'm sorry 300,500 just because hey that amount is about typical which you'll find you know to replace like a water heater or you know maybe some flooring you know something that's minor right that they don't really want to call you for. However it's up to you. So you can have as much control or as little controls you want. If you want to give them a thousand dollar deposit right and say they cover anything that happens within a thousand dollars, that's great. You can do that or you can you know you can just do the smaller amount; up to you. So that stuff's negotiable alright. Let’s move on. Let’s talk about contracting okay. Now with contracting, contracting you can get a little bit you know a little bit crazy. Because again right you may run into this whole adage right. You get what you pay for. Now I do not believe that adage is true all right. I do believe that there are folks out there that are willing to work with you and willing to help you out, especially if you're just starting out okay. I found a few folks that have helped me out and they knew that I was just starting out and because of that, they also kind of helped me along right. So as in what I mean is they explained to me how things worked okay. So first of all you never want to get a contractor that does not give you a scope of work upfront okay. Because that scope of work is going to tell you what the estimate is for the repair and you can also negotiate with contractors and figure out okay what happens if things go out of budget for this repair. Am I covering it? Are you covering it right? What are these certain things? Okay so these are certain things that you want to talk about. there are contractors out there that will cover it if it goes over budget right and so you just have to negotiate that or maybe you could negotiate a certain amount. So if we go over budget right you handle fifty percent, I handle fifty percent right. These are certain things that you can do. Okay you can also negotiate certain things in the repair right. So let's say if you want to update your kitchen right, you want to take out a wall, you want to update your backsplash you want to throw in countertops you know all that good stuff. Well so the materials cost is the materials cost. You can't get around that. but with the labor cost you can certainly get around that if you decide say you want to put in some of the work yourself. Again if you have a good relationship with this contractor, this won't always be the case. Because contractors need to be insured right and you may not be under the coverage. So keep that in mind. But at the same time - this is your house. So you can pick and choose what stuff you want them to work on and what stuff you decide you're going to do yourself okay. So keep that in mind right. Everything is negotiable when it comes to you know these certain things in real estate all right and it's contracting is another one. All right let's talk about a realtor. Okay if you're working with a realtor especially a really good one all right this can be really great. You can negotiate that fee that they get paid. Now there are certain states that lock that and require it. So not all of the states will have that fee negotiable. However you can negotiate something else right - with the contract that will help you get some of that stuff back right closing costs. Alright closing costs are another huge thing when it comes to negotiating your price. I almost lost much thought there. But yeah so when you negotiate your contract right closing costs are something you can cover. It’s something your seller can cover right or it's something that you guys can share and these are all things that you can delegate inside the contract, so that it makes sense for both parties okay. Now you want to make sure that you're doing your due diligence on what these closing costs are actually going to cost you okay. Don’t assume that all right yeah I'll cover closing costs and we can reduce the price and it'll be good to go right. Because a lot of times those closing costs may be really expensive and all closing costs are out-of-pocket expenses okay. Unless you are buying with your VA loan okay. If you're buying with your VA loan those closing costs get wrapped into your loan and as a matter of fact on that point that brings up a great one here. If you have a good relationship with your lender you may be able to wrap those closing costs in to your loan as well. Payment and all the closing costs may wrap into that loan as well. Right and now you've got the seller in second position you've got the bank in first position and you know and you've bought a property with zero money down you know I mean this stuff's possible out there. I've read blogs and read stories I've spoken to investors. I mean you really are only limited with your creativity in any deal okay keep that in mind. Don’t ever let someone tell you can't do anything okay. I was just talking to a friend about this yesterday. Do not let anyone tell you that you can't do something right. Because the moment you do you limit your thinking, you limit your creativity and you hinder your ability to succeed all right. Now I absolutely love this rapid deployed thing. Not only did our student motivate the heck out of me, this new podcast with it. But I really want to go ahead and promote this package to you folks out there who are maybe you know maybe you started right and you're looking to excel or maybe you haven't started and you're looking to have the fastest track possible. Our rapid deploy program is amazing ok. Voter if you're familiar with it or not I don't know, but it's like this little walkie talkie app right and so all our rapid deploy students get this walkie talkie app and they literally have access to us 24/7 ok.
It’s incredible. So much frigging value in this thing, I didn't even realize it until we started using it and it's amazing. I mean this guy's even overseas which also makes it really incredible. Because you mean he's sending us messages in the middle of our nights and then we wake up and where you're just boom right there and responding and sometimes there's a little bit of crossover, which is cool. But yeah I mean it really doesn't matter wherever you are in the world you'll have access with this thing. So super super super awesome plug for voxer. Because that thing is amazing and I think there are other apps out there that would like it. But that's what we use and a definitely great plug here for this rapid to play program. So you guys need to get tapped into this resource okay. You absolutely do. 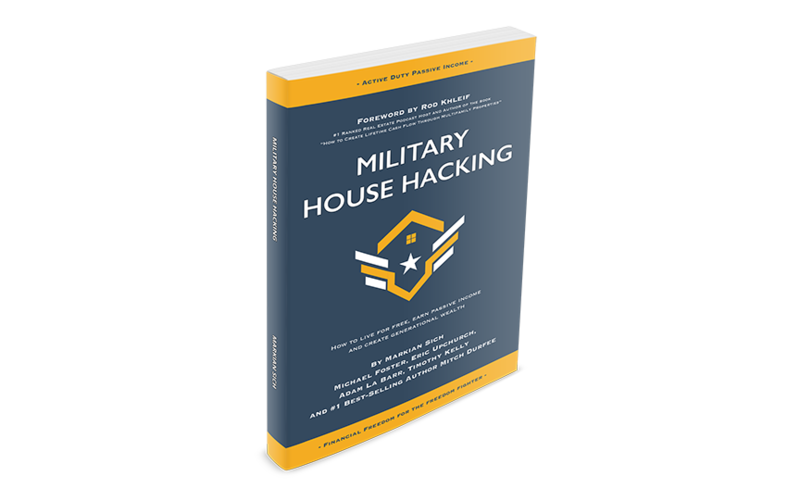 If you are struggling with anything real estate-related and you want some mentoring, you need to get plugged into this. Because this is going to increase value so much and you have access to our entire team alright. So yes man everything is negotiable. Guys keep that in mind. Go out there and try this and no matter what it is that yet you're if you're using in the real estate space, try and negotiate it. Again remember it's a lot easier for you to do that once you build your relationship and it's also easier to do that when you shop around then you have things to compare right. Like insurance, insurance is another thing that's negotiable. All right don't ever take your insurance quote and think that hey I'm locked into this too. All right I've literally brought two insurance quotes to someone and said hey in these two instances I got a lower price, what can you do for me? And the very next day I got a quote that was lower than that with the same coverage. So keep that in mind all right. Anyway alright guys I'm out of time. Thanks so much for listening. Again make sure that you guys are getting out there and taking action ok. I want to hear some awesome things that are happening in your life. Go ahead and hit this up on our start the spark program. Alright we got our own little mighty Network community and I want to hear what's going on with you guys. Alright or tapping into the Facebook group or tapping to the Instagram share what's going on. We want to be able to help you guys and provide value. But if you're looking for the most value that you can probably get from our program that rapid deploy is the best thing let me tell you oh my goodness. Alright now we've got so much stuff coming on, I don't even have time to share it right now. But make sure that you are getting ready for the book launch in a couple days. Woo super excited about that. It’s going to be awesome. Alright guys, I am out of time. Loved talking to you guys and I got to run. So I will catch you later.